It’s happened again, cyber criminals have stolen digital certificates related to companies recognized reliable to sign malicious code. This time the victim is Adobe and according its security chief, Brad Arkin, a group of hackers have signed malware using Adobe digital certificate obtained compromising a vulnerable build server that was used to get code validation from the company’s code-signing system. The hackers have signed with a valid and legitimate Adobe certificate at least a couple of malicious utilities, a password dumper and a malicious ISAPI filter, the two malicious programs were signed on July 26 of this year. The Adobe firm has decided to revoke the certificate to issue new ones for legitimate Adobe products also signed with the stolen certificate after July 10, 2012. We must consider that despite an illegitimate use of the certificate, any code and document signed before the revocation date is considerable as valid. Actually it’s not clear when the breach occurred, the company has discovered that it was re-issuing certificates for code that was signed with the compromised signing key after July 10, 2012, that means that the hackers have been using these files for about three months. It is believed the attackers were planning to use them in a large scale attack due the nature of the signed applications. Events like this raise concerns on the security level of producer source code and on the chain of trust managed to guarantee on code authenticity. The main problem is how many Adobe’s software were signed by the build server? Adobe did not identify the product exactly but declared that it isn’t one of the most popular Adobe Reader, Flash Player, Shockwave Player or Adobe AIR. 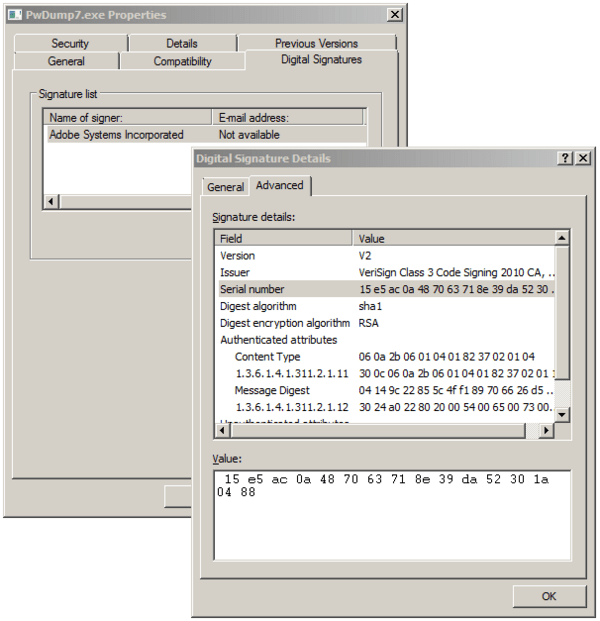 Some of the principal security firms have already released detection tools to detect the malware signed with Adobe certificate, Sophos for example has released a tool that identify them as Troj/HkCert-A. Last year was a terrible year for the certification authorities, the number of successful attacks against some major companies reported was really high and totally out of any prediction. Many attacks have had disturbing consequences and it all began, or so we were led to believe, with the case Comodo. Then came other illustrious victims, like DigiNotar, a Dutch certificate authority owned by VASCO Data Security International. On September 3, 2011, after it had become clear that a security breach had resulted in the fraudulent issuing of certificates, the Dutch government took over operational management of DigiNotar’s systems.Few weeks later the company was declared bankrupt. Why steal a CA certificate? Malware production – Installation for certain types of software could needs that its code is digitally signed with a trusted certificate. By stealing the certificate of a trusted vendor reduces the possibility that the malicious software being detected as quickly. That is exactly what happened for Stuxnet virus. Economic Frauds – digital signature give a warranty on who signed a document and user can decide if trust the person or company who signed the file and if trust the organization who issued the certificate. If a digital certificate is stolen we will suffer of an identity theft with serious consequences. Some bot, like happened in the case of Zeus banking malware, could be deployed to steal site certificates so that they can fool web browsers into thinking that a phishing site is a legitimate bank web site. Cyber warfare operations– Criminals or governments could use the stolen certificates to conduct “man-in-the-middle” attacks, tricking users into thinking they were at a legitimate site when in fact their communications were being secretly tampered and intercepted. That is for example what occurred in the DigiNota case … companies like Facebook, Google and also agencies like CIA, MI6 were targeted in Dutch government certificate hack. Personally I believe that the attack has with primary purpose the cyber espionage and it is high probably that we are facing with state-sponsored hackers that since now have had the opportunity to spread malicious code recognized as legitimate.